Well, that was a whole lot of treading water. 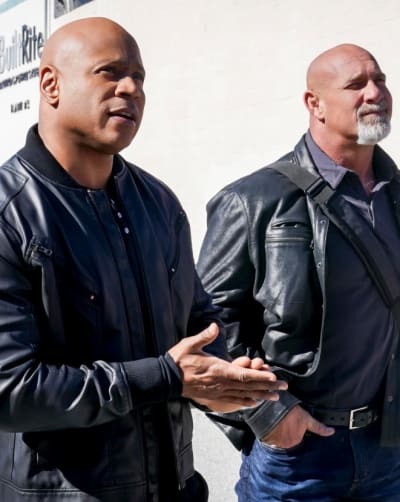 There was much foreshadowing, along with the necessary amount of action and gunfire, on NCIS: Los Angeles Season 10 Episode 19. Yup, we're still coming down off the high that was Kensi and Deeks' wedding on NCIS: Los Angeles Season 10 Episode 17. Maybe that should have been the season finale. It's been a hard act to follow. The bad news here was that Hetty's appearance at the wedding now smacks on being a cameo for the season. On the plus side, no Rogers this week. Instead, it was mostly everyone doing their own thing, with only a slight bit leading anywhere. If you tuned in to see the team in action together, you needed to watch quickly, as squad members went their separate ways shortly after the opening credits. We barely got introduced to Steve Evans, that poor, worked-over CID agent who got partnered with Kensi on that undercover op. 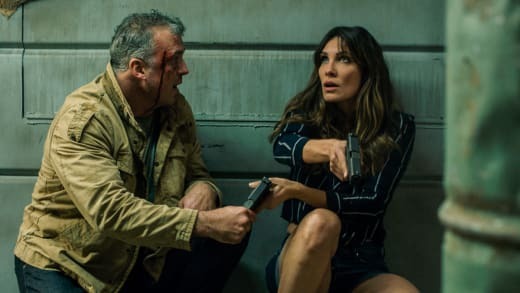 It's a good thing that the storyline was so simple that it was easy for viewers to catch up as it was gunfire, some more gunfire, then some brief exposition about what was on the recovered hard drive. Where to start? How about with Callen? 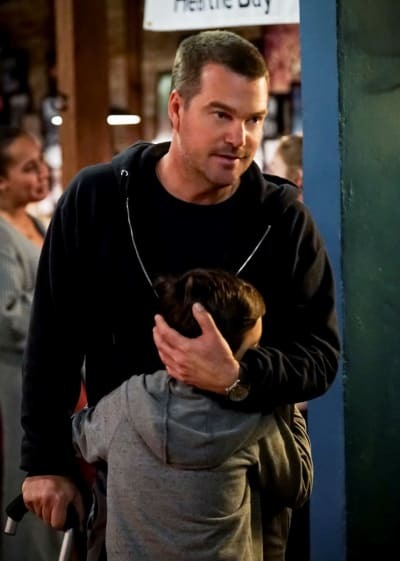 Callen has been estranged from his sister Alex ever since his father was sent away in a prisoner exchange on NCIS: Los Angeles Season 9 Episode 16. Alex has unfairly blamed Callen for that travesty because, well, he couldn't stop machinations high up in U.S. intelligence. At the time, the OSP was still plagued by Mosley's leadership, so Callen got no support there, and Hetty, then recently back from her captivity in Vietnam, really was in no position to pull a rabbit out of her hat yet again. Oh, well. Callen wouldn't be Callen if some unnecessary drama didn't get dumped on him. He couldn't just lose his father; he had to lose the rest of his family as well. Callen needed a little happiness in his life, I mean beyond that sweet unfurnished apartment above Deeks' bar. 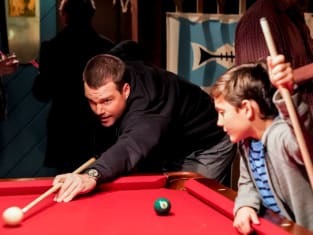 So that fortuitous gunshot wound gave Callen the perfect opportunity to beg off and watch his nephew Jake when all of Alex's regular sitters were unavailable. 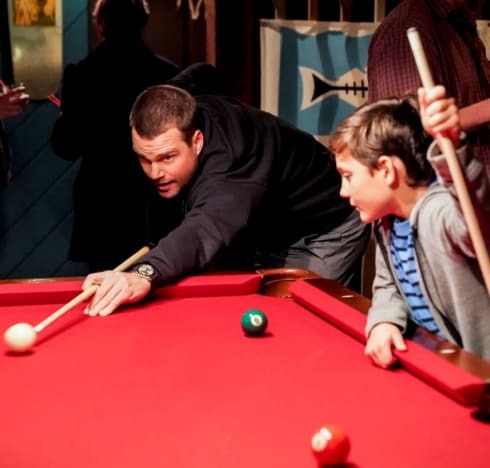 It was amusing to see how inept dedicated bachelor Callen was around children, resorting to blackjack and pool to amuse Jake. I suppose when you had no childhood, it doesn't give you a frame of reference. Fortunately, Jake was the most technologically skilled person in the bar and was able to save Kensi's fundraiser. That's frightening, too. There was a crack in Alex's armor after this outing, despite finding Jake playing pool at a bar. And really, how many times will Jake have to ask "Can Callen come over to play Fortnite?" before she caves? Next, Callen has to figure out how to get Anna out of prison. That has to happen this season, right? Or are TPTB content to have Anna out of sight, out of mind? Where to next? San Francisco? That's where Eric went on his job interview with the tech company that was recruiting him. The wrinkle was that Nell's mother was desperately sick so much so that her parents were moving to San Francisco where she could get specialized treatment. Because similar East/West medical treatment would be hard to find in La La Land. Yeah, that very convenient development came out of the blue. Is there some way that Eric could go and Nell could return, instantly improving the show? 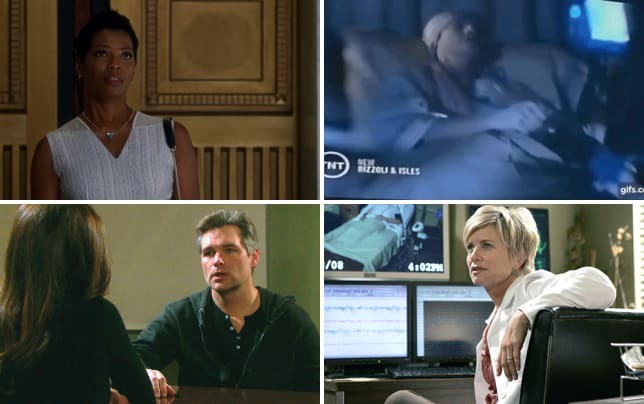 Deeks is still there for comic relief so that Eric wouldn't be a significant loss. Couldn't Nell's incompetent older sister Sydney step up and help out their parents? 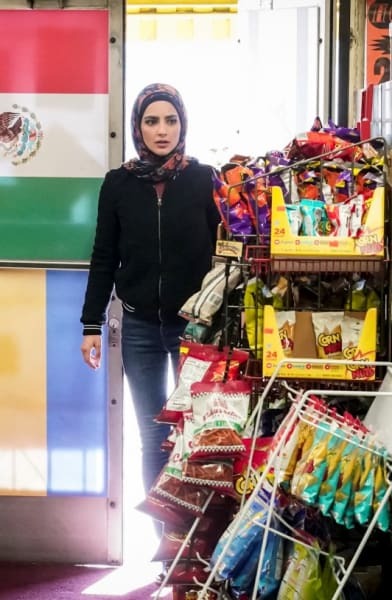 She must be at loose ends since Homeland Security must have canned her after her schoolgirl exploits on NCIS: Los Angeles Season 10 Episode 18. It's probably a red herring, but computer whiz kid Fatima has been around a lot recently. So maybe something is in the works with Eric and/or Nell. Speaking on Fatima, she's still learning. And who better to learn from than Sam and Lance? Fatima got to tag along to help out what Eric and Nell usually do when Sam and Lance hunted for a rogue Border Patrol agent that a cartel made the mistake of attacking. It took both Sam and Lance to keep Fatima safe, as her confidence outweighs her abilities, so far. That's not to say she can't get there, but she requires guidance. 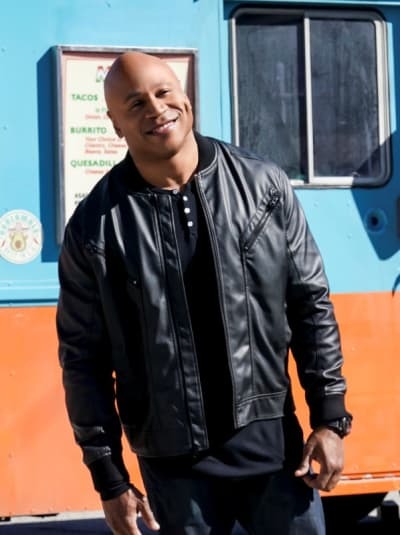 Was it a little soon for Lance, introduced on NCIS: Los Angeles Season 10 Episode 7, to be back already? I don't think so. He and Sam are kindred souls. They're both ex-military and had lost their wives. They work together well. And once again we got to hear that Sam isn't ready to leave with Lance, at least not yet. The unhinged agent, taking his daughter along as he slays cartel thugs and chases his wife's abductor, was an interesting touch. He shouldn't have ended up in cuffs, but he did produce quite a body count, so it's up to a smart lawyer to get him off on extenuating circumstances. Finally, there was Deeks and Kensi trapped in the bar from hell. I liked the idea of the bar, which gave the squad a place to gather at case's end. But Deeks and Kensi never seem to be on the same page. Deeks decided to modernize on the same day that Kensi was planning an environmental fundraiser. These two talked about their wedding plans seemingly for years. Can't they talk about the bar instead now? Kensi made a good point. How can a couple that has defied death all these years get so stressed out from running a bar? It seemed they figured out that they need to hire experts. I say turn over running the bar to Roberta and be silent partners. All these potential character changes make me wonder if maybe there's a cancellation coming. I mean, CSI ended without much warning. To tide yourself over next Sunday, when the ACM Awards intrude on the CBS schedule, watch NCIS: Los Angeles online. Should Alex lighten the hell up? Should Deeks and Kensi unload the bar?